If you come across this set at a bricks-and-mortar store—an increasingly unlikely scenario, these days—you may not immediately realize what it contains, as both the cover and spine identify these works as “Fait pour les Anglois.” Only on the back cover can one read, in a small font, that these are the English Suites. This seems a little precious, even if the label is Belgian and the performer is French. Scholars still are not entirely sure about precisely for whom these suites were composed. The two most prominent candidates are Dieupart and Handel. Both were living in London at the time, but of course the irony is that neither was born in England. It hasn’t been long since I reviewed a Simax recording of these works as performed by Ketil Haugsand. I enjoyed it, finding it lively and imaginative, but I liked a comparison recording by Blandine Rannou (Zig-Zag Territories) even better. Dubreuil is closer to Rannou, I think. Both of them make the dance movements actually dance, and, as with Rannou, there is a palpable happiness, even joy, in movements such as the Prelude to Suite No. 4, and the Suite’s concluding Gigue (Haugsand tends to be, if not exactly staid, more buttoned-down than the other two.) 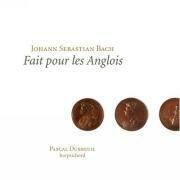 Dubreuil’s tempos are steadier than Haugsand’s, without becoming boring or metronomic. He can play with wonderful smoothness, when the music invites it. He is a more exuberant embellisher than Haugsand as well. This is a good thing, generally, although in the sarabandes, for example, a plainer approach would have made the melodic lines stand out in greater relief. (If the material is repeated, then that is the time to embellish liberally.) In the Sarabande to the Fourth Suite, hardly a measure goes by in which Dubreuil doesn’t add something of his own. It’s a little fussy, although I wouldn’t call it inauthentic. Dubreuil, a pupil of Yannick le Gaillard, plays a modern copy (by Titus Crijnen) of a Hans Ruckers harpsichord dating from 1624, which of course is somewhat before Bach’s time. It has a nice sound, although it is not as rich as the instruments used by Haugsand and Rannou. The recording itself probably contributes to this impression, as the microphones seem to be placed at some distance from the instrument, and the recording venue (a church) is reverberant. Even so, the music never loses its clarity, and I think that is a function of Dubreuil’s drier-sounding instrument (as well as his own touch, of course), so the engineers have calculated well. I find Haugsand enjoyable but rather sober, and Rannou ebullient. Dubreuil is more unpredictable than either, but the clarity and the geniality of his playing make these versions of the English Suites a strong contender.